That was cool as hell. Hey, I had a Chevy like that, by the way that dude is one fast worker, cool pipes. that was fast, very cool video and ofcourse the motorcycle too. 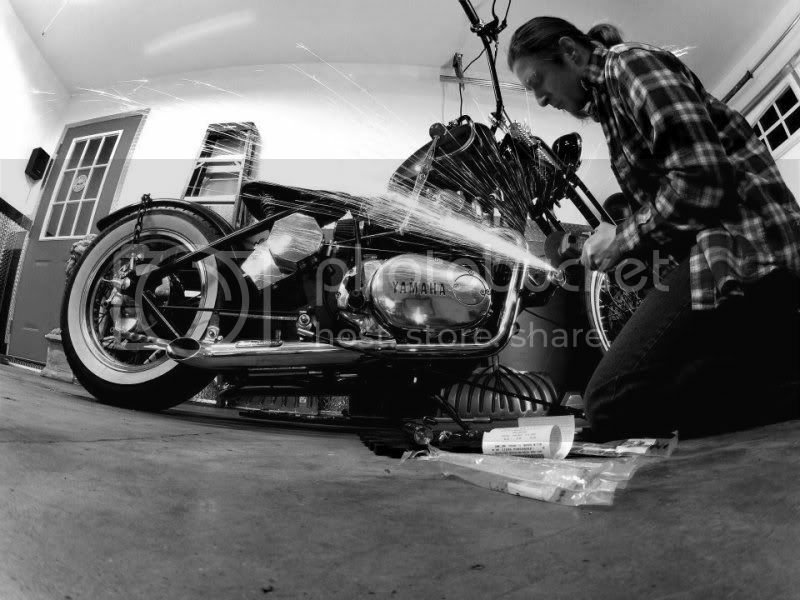 Very well layed out, build the bike, tear it down, build the bike and video and rider off into the sunset. I am sorry I had to skip a lil but I ready did enjoy the time and effort and the assume idea of a video build. Love the pipes, I have only seen a set like that about 20 years on my bud Billies XS. I live in northern Canada and all around there is snow. This PMS (Parked Motorcycle Syndrome) is killing me. 2 XS’s and a KLX 400 sitting in the garage and I cant ride. BOOHoo! Agree with Poofish. This should be mandatory for every build. Nice garage, nice bikes. Might have built that bike faster if you weren’t on the phone all day lol. awesome! if only it was so quick to do a build!! watta hoot! ingenius! takes me longer to poop. That is the most entertainment I have had in the last 10minutes. Cool to watch the bike come together, nice styling and sweet lines. Your work shop is well organised and it is the first time I have seen a welder where a crevat. Jolly good old chap. Hahaha! Great stuff, and love the frame and pipes! Killer lines. can I buy this cool bikes seriously?? Is there any phone number that I could contact you? ?